This scream to God for help in a state of great pain was uttered by Yulianus Yeimo, aged 45 years old, an ex primary school teacher who suffered mental illness towards the end of his life. In 2008 Yulianus had completed education at a higher level for teachers at the ISSP Institute in Enarotali, Paniai, obtaining a degree in Social Sciences. The most saddening incident of violence against Yulianus occurred on 18 August 2012 at around 0900 hours. For 3 years since 2009 until that date, Yulianus Yeimo had always worn the old faded and shabby police uniform left by his late father together with matching shoes. Each morning he had climbed the hill of Bobaigo then when he reached the top of the hill he would take his position before the white and red Indonesian flag that flew (which at that time was flown by the Indonesian military at that location). He would spontaneously show respect to the flag and then take it down. Yulianus had become a little mentally disturbed and he acted each morning in this routine as if he was a member of the Indonesian Police force. His father before him had been a police officer under the Dutch so Yulianus remembered the ways of his father. That day the flag that was in his hand and became into three pieces. One part was tied around his left arm, one part to his right arm and the third part around his head. After he descended from the hill he walked towards the town of Enarotali until the place where three roads meet leading to Kogekotu. When he passed there in the direction of PLTD Enarotali, a group of immigrants approached him and immediately launched an attack on him punching him in the face. Once knocked down he was kicked again and again in the chest. His head was beaten using an iron bar and a stick. Collapsed on the ground his face and chest were trampled on again and again. Blood flowed from his face and nose. “Tolong…, Tolong…, Tolong…, “Naitai Ugatame wae…, itoo ko anii bokaga noo…,” he called out to God in the local Mee language. He was dragged a few meters then forced to stand but fell, then was dragged again. His head and body were beaten again with the iron bar. He was forced to stand but fell again and was dragged again until the asphalt road. Then at approximately 100 metres from the kiosks on the corner of the airfield at the front of PLN Enarotali, his body was left sprawled on the ground unconscious. Not long after he was dumped a Police patrol vehicle from East Paniai came and took him to the East Paniai police station for security reasons. After he had regained consciousness he was sent home. It is suspected that Indonesian military (TNI) and police had been carrying out retaliation at that time against the Paniai community, with the result that even a person who was mentally unwell had become a victim of their aggression. It is suspected that the TNI were supicious that Yulianus Yeimo was not in fact mentally unstable. On 25 January 2014 at 0700 hours Yulianus Yeimo was found dead at the Boutai River at the village of Dagouto in East Paniai, with injuries on his nose, chest and face and with impressions in a number of places on his body. According to Yulianus Yeimo’s family it was four days before his body was found. He had not been seen for that period. He was suspected to have become a victim of violence of an unidentified assailant and that the violent act had been committed on the shores of the river then the victim’s body thrown into the Boutai River. 1) That Yulianus Yeimo became the victim of violence of unidentified person / persons on the banks of the river, then his body was thrown into the river so that it would be concluded that Yulianus died from drowning. 2) It is suspected that Yulianus Yeimo was killed by either a ‘silent operation’ or alternatively was a victim of retaliation. 1) That the Head of Police in Papua and the Commander of XVI Bumi Cendrawasih immediately give instructions to the Head of Police in Paniai to carry out an exhaustive investigation into who was responsible for the violence against the late Yulianus Yeimo. 2) That the Head of Papuan Police and the Commander of XVII Bumi Cendrawasih immediately cease all military operations including road patrols in Paniai as the area is not a security risk and is controllable without those forces. We acknowledge that it may be a work task of the Forces however at times the Forces fail to become aware which circumstances present security situations and risk becoming unstable. 3) We request that the Commander of XVII Bumi Cendrawasih withdraw all military personnel, both regular and additional forces now in Paniai, including Kopassus, Paskhas and National Intelligence personnel. Furthermore that the Head of Police in Papua withdraw its members from the gold prospecting area of Paniai as their presence only creates mistrust between the forces and the community. John NR Gobai is the Chairperson of the Traditional Customary Council Paniai and a long time human rights investigator. FRIDAY FILE: After 42 years of Indonesian rule, women in West Papua continue to fight for their freedom and peace. West Papua – officially under Indonesian rule since 1963 – is located in the Western half of the island of New Guinea – 250km north of Australia. In 2012, West Papua Media conducted interviews with four West Papuan women who are active in the nonviolent movement for freedom. Here, AWID gives some background, and excerpts from the interviews. With a track record of denying foreign journalists access to West Papua (or arresting and deporting them) – the Indonesian government continues its stronghold over this resource-rich region. A stronghold held together largely by the presence of the Indonesian military¾which are known for their violence enacted with impunity, but also by the silence of the international community. Free West Papua estimates that “since 1962, 100,000 people have been killed or disappeared by the brutal military regime. Thousands have been raped and tortured and entire villages, especially in the highlands, have been destroyed.” In May this year, West Papua Media published one disturbing report of recent killings and rapes, perpetrated by the Indonesian military. To be an independent nation is the goal for West Papua¾freedom from Indonesian rule and its associated violence. But this is also a struggle for culture and for the environment. Lani says since she joined the struggle “my friends have been arrested, some have died in jail, some have fled to Papua New Guinea. It’s like we are migrants in our own land. So many people from Java, from Sulawesi, from Sumatra have come to our land.” Large scale migration of Indonesians into West Papua has the potential to unthread the very fabric of their culture and existence – and the mining and deforestation of pristine forests threatens to destroy the environment as well. Read the Enough is Enough report (testimonies of women from West Papua) from the International Center for Transitional Justice. 1) “We want to be free”: An interview with four women from the West Papuan Movement for Freedom. 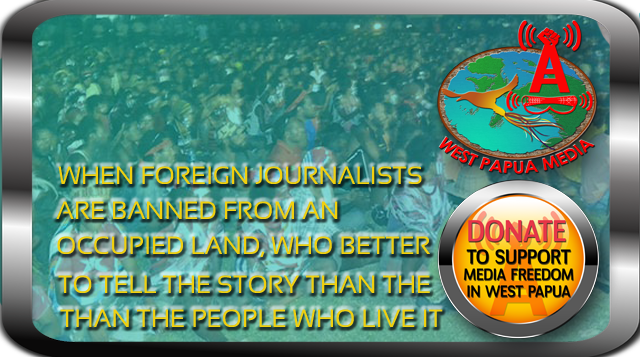 Interview by Alex Rayfield and Claudia King from West Papua Media. Photos taken by Javiera Rose. In 2012 Alex Rayfield and Claudia King had the privilege of interviewing four extraordinary West Papuan women, all active in the nonviolent movement for freedom in West Papua, a Melanesian nation-in-waiting occupied for more than five decades by the Indonesian military. All four women had known deep pain as a result of the occupation of their homeland and the corrosive fear of being targeted for extermination. Some wrestled with hate of Indonesians that at times threatened to overwhelm them. All had imagined, even desired, to wage armed struggle against the Indonesian government. But instead of being pacified by terror or succumbing to cravings for revenge these four young women refuse to give into hatred or relinquish their dreams of freedom (merdeka). All are engaged in efforts to realize their hopes for a restored Papua without resort to weapons or violence. How could this be possible? King and Rayfield travelled into Indonesia and West Papua to learn about why they joined the Papuan movement for freedom, what they long for, why they had chosen to struggle nonviolently, some of the challenges they faced and about the experience and role of women in the movement. Since interviewing the four, one of the women, Fanny Kogoya, the Director of Friends of the Earth Indonesia, Papua (WALHI Papua) and a former central committee member of the West Papua National Committee (Komite Nasional Papua Barat or KNPB), has had to flee the country. Another KNPB member Rina Kogoya, Secretary of the Port Numbay (Jayapura) branch, has decided to remain in West Papua but has gone into hiding as the Indonesian police systematically try to destroy the organisation through a campaign of summary execution (22 KNPB members were killed in 2012 alone), arrest, torture and trumped-up charges of treason, hatred of the state, bomb making and murder. The other two women are Heni Lani, from the Alliance of Papuan Students (Aliansi Mahasiswa Papua or AMP) and Ice Murib, Chair of the Movement of Papua Women (Gerakan Perempuan Papua). When and why you got involved in the movement? My name is Fanny Kogoya. I am a Lani woman from the Dani Tribe, Wamena, West Papua. I am now the Director of the Papua office of Friends of the Earth Indonesia. I first became active in the struggle in 2000. At that time I was 20 years old. I joined in a number of forum discussions with student activists from the Papuan Student Alliance (Aliansi Mahasiswa Papua). It was first semester of university but before I moved to Jogjakarta. For years the Dani people experienced repression from the Indonesian military. Prior to 1998 – when Suharto was overthrown – the Dani’s homeland was in a military operations area (Daerah Operasi Militer). During reformasi, in 1998 and 1999 there were lots of demonstrations and my friends and I felt like we could do something. But when I was in high school, before 1998, we could not speak openly about freedom for West Papua. It was even difficult to buy or sell Papuan music. If you spoke about freedom during these times you were accused of being a part of the GPK (Gerekan Pengacau Keamanan) “the movement of security disturbers” [a police and military code for the OPM or Papua Freedom Movement]. As a child I often saw people beaten-up by the police, often without any reason at all. When I moved to Jogja I started to remember all of these things that had happened to me as a child and for the first time I was able to talk about that with other people. It was like a lid was lifted off of a boiling pot. One of the things I we talked about was when the biologists were kidnapped by Kelly Kwalik [a legendary Papuan guerilla leader killed by Detachment 88 in December 2009]. Prabowo, one of the Kopassus [Indonesian Special Forces] commanders tried to release those hostages but what happened was that a whole lot of people were killed up in the highlands. I started reading about the history of West Papua’s integration with Indonesia, the so-called integration and I began to realise just how much wrong, how much injustice the Papuan people had experienced at the hands of others. As a student I started to compare the policies, the government policies, with what was actually happening on the ground. On the one hand you had the constitution which talked about freedom and the Pancasila which talked about social justice but in reality there was very little political space for us Papuans. When I was living in Java I could compare the health and education system with what we had in West Papua and it was just so different. Things were so much better in Java. What is happening in Papua now is just like the New Order under Suharto and just like the reformasiperiod after Suharto. There is very little political difference for Papuan before or after Suharto. After Suharto we thought there would be more space for us but Papua has yet to experience a real democratic space. These kinds of things make me really emotional. I realized I had to resist. I can’t be silent. I have to resist. When I was a student studying in Jogja I came to understand that I am a person who possesses land; that my life is very different from other Indonesians. The connection to land, to Papuan culture, to Adat, is quite different from what is in Java. Our relationship to our ancestors is different from those in Java. Papua is not Indonesia. Indonesia is very different from Papua. Papua is something completely different from Indonesia. The first time I got involved in the struggle was in 2008. I had just finished my university studies. This was already 10 years on from Suharto and in the period of reformasi, so people felt freer to talk about the issue of freedom. The hopes embodied in reformasi gave me spirit [semangat] and encouraged me to get involved in the movement. My mother would often speak about the things that she experienced in her life. She talked about what happened in Wamena in 1977 when there were massive military operations. My parents were pastors of the Kingmi church in Wamena at that time. Actually my father was one of the victims of 1977. Indonesian soldiers cut open his chest with knives. They took out the contents of his stomach and they removed his heart. My grandfather saw this happening with his own eyes. As the soldiers were cutting open my father’s chest they were saying, “Where is your God now? Who is here to save you?” My grandmother and my grandfather then fled to the forest where my mother and I were hiding. They told us what had happened. And of course this event really traumatized my mother. Even now when she tells this story she always cries. So that’s one reason I’m involved in the movement, that’s one reason why I struggle. After this we moved to Jayapura. We lived in Dock 5 with Benny Wenda’s people. In 2000 Benny started to become more active in the movement. Benny and all of my family had to flee. We ran to Papua New Guinea. After a little while, when it was safer, my older brother, who was working in the civil service, brought us back to Jayapura. Of course Benny got refugee status in England. We watched what he did from the outside; how he continued to struggle. That inspired those of us who lived inside Papua to continue to struggle in the movement. It was in this context that KNPB entered. My friends and I said let’s stay with this organization, let’s sit down with them and see what we can do together. My name is Heni Lani, I am from the Dani tribe of Wamena. I was 18 years old when I got involved in the struggle. That was in 2003. But before that, as a girl, you know, I had experiences like Fanny and Rina. When I was in primary school the police came to my house and arrested my father. Even as a little girl, I could see the way the police treated my father was not respectful. It really made us angry. At that time my father was a principal of a primary school. Back then I had no idea that in addition to being a principal my father was also organising indigenous people in Wamena. So in the beginning I had no idea why my father had been arrested. And I guess that is what really made me angry. Two days after the police arrested my father he came home. For a week my father just stayed in the room with my mother. As children we had no idea what had happened. I stayed with my family in Wamena until Middle-High School when I went to a Catholic boarding school. Every Saturday we’d have a chance to go home and be with our family. One Saturday night when I was at home, two police officers came around to my house. They were in plain clothes but they were carrying weapons. They arrested my father again. I still remember it. We were sitting down having dinner and the police came into my house. They grabbed my dad and they dragged him outside. The next thing that really influenced me occurred when I was in Senior high school. Actually Rina and I were at the same school. One afternoon, around the time Benny Wenda was arrested, I was hungry so I went outside the boarding school to buy some cake. I was still wearing my school uniform. I bought some cake from a street seller and I put it in a big plastic bag. This man was standing next to me and he said, “ hi younger sister, good day. What’s your name.” I told him “my name is Heni.” He asked me where I was from but because I didn’t know him I said, “Father would you like some cake?” He took some cake then I crossed the road. I crossed the road and I noticed there were lots of police. Suddenly the police ran across the road and grabbed the guy I had just given cake to. The police dragged him by his hair and beard. It was only then I realized it was actually Benny Wenda. Benny Wenda shouted out in Lani, “quick, help me, grab this bag”. There were no other people from Wamena there so they did not understand what he was saying but I understood. Then he said it again: “help me, grab this bag”. But I didn’t do anything. I just stood there watching him cry out. The next day in the Cendrawasi Post [the main daily newspaper in Jayapura, the capital of West Papua) there was a big photo of Benny Wenda on the front cover. The newspaper sellers were calling out “C-post, C-post, Benny Wenda arrested, Benny Wenda arrested.” I bought a paper and started reading it. In the article it said in his bag were a whole lot of sensitive documents; the morning star flag, his passport, all sorts of things. After reading the C-post I realized, wow it really was Benny Wenda that I met yesterday. Before that I only knew his name. I had never met him before. I can’t tell you how guilty I felt, like I had done some really wrong. I didn’t go to school that day. For the next three days I was carrying this burden. I kept on thinking to myself, why didn’t I do anything? Perhaps if I knew it was Benny Wenda I would have gone and helped him, grabbed his bag to keep it from the police. That was the third experience that influenced my political development as an activist. After school I started studying at University but I continued to stay at the Catholic dormitory. I would often witness demonstrations on the main road in Abepura. At our campus there was a small discussion group led by Jeffrey Pigawak. I started to attend and began to ask questions; why did the police do this and why did the police do that? I wanted to try and understand the things that I had witnessed as I was growing up. Bit by bit I became more active in the discussion group. That was between 2002 and 2003. In 2003 I made a decision that I would become more active. The first group I got involved in was the street parliament (Parlamen Jalanan), which was set-up by Filip Karma and Yusak Pakage. On the April 5 2004 I got my political education from Filip Karma. I remember it was at the beach in Hamadi. Filep Karma told me all the things that happened in our history, the whole history of our struggle. He told me everything going right back to the time of the Dutch, about Angganeta Manufandu in Biak during the 30s and 40s, the role of Mama Yosepa in the highlands, all these things. Before I received my political education from Filip Karma it was like I was sitting in this small dark room with little rays of light coming through. These rays of light were like my father getting arrested and Benny Wenda getting arrested. When I got my education it was like the door of this room was flung open. It was as if I went outside for the first time and saw what was really happening. The day on the beach in Hamadi was the first time I saw the Morning Star flag. I grabbed it and held it. Finally, I realized, I’m not an Indonesian, I’m a Papuan! All these events culminating with the political education I received from Karma and Pakage strengthened my commitment to this struggle. Since then my friends have been arrested, some have died in jail, some have fled to Papua New Guinea. It’s like we are migrants in our own land. So many people from Java, from Sulawesi, from Sumatra have come to our land. We don’t have space to do anything. I finally discovered that the reason my father was arrested was because they wanted to take his land to build a stadium. My father was defending his land but they took his land to build a stadium. My father had said if you want to take my land to build a school, well then okay, we can talk about it but they didn’t care. When I became involved in the movement my father told me all these things. So I have no reason to sit down and be quiet. I first got involved in the movement in 2008 but something happened to me in 2006. I was in Jayapura in class three of senior high school at the time. The date was March 16 2006. There was a big action in Abepura. Lots of students were involved including Heni. My friends and I were in Kotaraja. We tried to get a taxi home but the road was blocked everywhere so we had to walk. It was quite a distance, maybe 20 kilometers. When we passed the road between the University of Cendrawasih and the Trikora football field, I saw students burning tires, they were blockading the road, and I saw Heni speaking. Suddenly I heard shooting. Students were running everywhere. I joined them. We ran and ran. I still had my school clothes and I was running for my life. The police were arresting people. There were soldiers everywhere but I kept running. I ran all the way home. The following day I didn’t go to school. I heard they were looking for students. Their pictures were everywhere including Heni’s. Her face was posted on the wall, along with other people who were wanted by the police. At that time in Tiom my grandfather would see the military come and take pieces of iron. They would heat them up in water and use them torture people. The soldiers would stab people with these hot pieces of iron until they died. The police would go through and sweep the village, searching for people. Helicopters hovered above while the police and army went house to house searching for people. One morning everyone hid in the church. The children, the women, and the men, they all tried to hide in the church. And then the Army came. Other people from other villages also came. The army and police asked people to come out of the church. My grandfather came out of the church and ran. He took my father who was still young and hid in the forest. The army forced everyone to come out of the church. The men were forced to strip down, to take off all of their traditional clothes until they were naked. At that moment one of the soldiers came up to one of my grandfather’s friends and in front of including the children, he slit his throat. Other people were killed that day too. I don’t know how many but I can tell you that my grandfather’s friend’s throat was slit. And then they made everyone eat his head. We can eat pigs, but we can’t eat human beings. That is why my grandfather and father fled to the forest. Everyone was grieving. In 2000 when I was in second grade middle school Morning Star flags were being raised all over the Baliem Valley. Every morning the members of satgas, a kind of unarmed militia set-up by Papuan Presidium Council, would raise the morning star flag at various posts throughout the valley. The president at the time, Gus Dur gave an order that the Morning Star flags had to come down. On the morning of October 6 2000 I went to school in Wamena city. The police and military were everywhere, travelling from post to post to try and take down the flags. I remember feeling confused. When I got to school it was so quiet, everyone had gone so I went home. 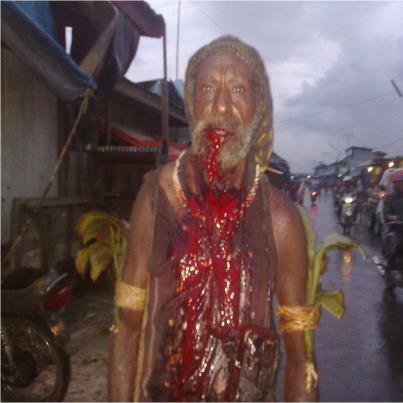 As I tried to go home a man from Biak asked me, “Who are you? Where are you from? You’ve got to go home, you can’t be here, you have to go home.” I ran down the main road all the way home. As I ran I saw police and military everywhere. I pass a satgas post where the police and soldiers are trying to force the flag down. I see a woman trying to defend the flag. She had her arms wrapped around it. I saw them beat her. They just beat her until the blood ran down her face. Along the side of the road people were being beaten and tortured. Of course seeing all of these things I was so scared. So I just ran. I ran all the way home. But when I got home nobody was there except my two younger sisters. At that time they were about 4 years old and 1 ½ years old. I was asked them, “Where is everyone? Where did everyone go?” My sisters told me that my mother was sick and my father was taking her to the hospital. She didn’t know what she should do, everyone was fleeing to the forest, everyone was running. My sister looked at me and said, “What should we do?” Nobody was there. Nobody was coming to help them. Then one of my grandmothers came she told me, “you can’t stay here, you can’t stay here, you’ve got to go, it’s not safe here.” So I got some powdered milk for the baby, some clothes for them and some food. I also got some shirts and shorts for my sisters. I grabbed a couple of things of my fathers, some documents that were important. Then I wrapped my youngest sister who was 1 ½ years, in a sheet and I wrapped and put her in a noken (string bag). I took my other sister who was 4 years old, by the hand. By this time it was already night and there was heavy rain. In the beginning I didn’t know where I should go. It was really quiet. We went to the forest, in the direction of a village. It was a fair way to that village and I felt really scared. I felt so little. I am taking my two younger sisters into the forest, it was the middle of the night and I didn’t know where my parents were and what had happened to them. Finally we arrived at the village and stayed in one of the houses there. I cared for, looked after my younger sisters. Early morning the next morning I could hear the planes flying overhead, looking for people. There was nothing we could do. We just had to stay in that room. We couldn’t do anything. When my father came back to the house from the hospital he looked for us but couldn’t find us. Finally he found us and we stayed there in that village for a week. When my mum came back from the hospital we returned home to our house and the situation started to get a bit better. Two years later in 2002 something else happened. There was a raid on the military post in Wamena. Some people stole a couple of guns. This happened one Saturday night. I remember we were getting ready to go to church. When the priest began preaching the army suddenly burst in and forced everyone out of the church and into the front yard where they pointed guns at us and told us to sit down. The soldiers kept asked us if we knew what happened. This man raised his hand and said something but it was dark and there was heavy rain. I heard the noise of footsteps but I didn’t see anything. Then before I knew it a soldier hit him and dragged him off to a patrol vehicle. After that everyone was too scared to say anything. The soldiers continued to ask us what happened but everyone was too scared to say anything. Finally the army left. When the army went people started to tell stories. Some people said that the many who raided the military base was Yustinus Murib and his friends. And of course my father was scared for us to go to school because our clan name is Murib. My father told us, if people ask you what your family name is, don’t tell them it’s Murib. Just go home if they ask. Don’t say anything because it’s really dangerous for you. These are some of the reasons why I got involved in the AMP-PT. I joined in demonstrations. In 2008 I also joined the demonstrations organized by KNPB. At that time, the highland students were being hunted down. Fanny and I had to flee. We lived in the forest for 5 months with other students, hiding from the police. Later I stayed with Reverend Sofyan Yoman. This was around the time his book was banned. I was at his house when officers from the national intelligence agency (BIN) and the police came to his house. They wanted to arrest Reverend Sofyan but he said, “This is my land, this is my place. I am the master of my own land. If the president orders you to arrest me, you have to ask, you have to tell the president to come here because I am the president of my own land.” The police and the people from the national intelligence agency left. They didn’t know what to do! I have witnessed all these things. They are part of the reason why I joined the movement. Why are you struggling nonviolently? Where does the courage to do that come from? We have to acknowledge that if you are going to struggle nonviolently there will also be victims just the same as if we were to take up arms. It would be a mistake to commit to nonviolent just to avoid suffering. Even though we’re struggling nonviolently the Indonesian state continues to respond violently. They arrest people, beat people, kill people. Often my activist friends say, “What’s the point. If we struggle nonviolently they’re going to beat us, arrest us … if we struggle violently they’ll do the same things”. Often people join the armed struggle because of their experiences. They’ve had these traumatic experiences and they make a decision to join the armed struggle. Often it’s an emotional reaction. Of course in our culture we also have a history of fighting back, a history of tribal warfare. All Papuans have courage, we are a courageous people. So with these three things – our memories of suffering, our history and culture and our courage – armed struggle is a real option for us. And there are many people who believe we can only get self-determination through violence. But Papuans are also a very practical people, we’re not a theoretical people. We know civil resistance can also work. So my dream is to learn more about civil resistance and how it works. I want to go back to the victims of violence, whether they are people who have been involved in the armed struggle or not, and I want to say, “There’s another way, there’s a different way”. Of course it’s difficult to influence those in the jungle who are fighting as a part of the armed struggle but I can influence those in the city and in places where I live to struggle nonviolently. We have to understand that the Indonesia military receives support from the Americans, from the Australians, from the Dutch. Papuans will never be able to match the weapons the Indonesians have. Unless all of these foreign countries that support the Indonesian state come and take all of their weapons away … but at this stage there is just no way we could ever compete. So the realistic option that I have is to organize people to struggle nonviolently. If we struggle through civil resistance more people can be involved, old people, young people can be involved. Involving all types of people, the whole Papuan society, can give us a tremendous amount of strength. Actually everyone thinks we Papuans need to take up arms. There are so many reasons why people want to take-up arms and fight back. Some people want to take up arms because they don’t have any trust that the Indonesian government is going to resolve the conflict peacefully but a lot of people want to take up arms because of the experiences that we have, they don’t know any different. But we do. If we take-up arms against Indonesia the response will be so fierce, so sharp, so heavy. But I understand why people feel they have to reply a death for a death, why they want to respond with violence. If I struggle through violence I am going to experience a number of problems. I’m going to lose a lot of my rights. I’m going to lose my best friends. And people are going to come and steal my rights, steal my land, and kill me. There are other people that are going to come and take over and possess our land. But now I see that there’s an opportunity to resist through nonviolent struggle. People at the grassroots need to know that nonviolent action can be really successful and I can give them evidence of that. We can learn from the examples of other countries. Lots of other countries have gained freedom through nonviolent struggle. People who have faced the same kind of problems as us have found a way through. When people know this they are going to be touched deeply. We can use our culture, our way of life to help our friends understand that actually they can struggle through nonviolent means. I can do this but I can only do all of these things because God is involved, because God’s hand is involved in all of this. The first thing that I have to do is acknowledge is that there is a part of me that sometimes wants to take-up arms. But then I imagine what would happen. I think about the numbers of people that will be wiped out. Like Fanny and Rina said we also need to compare the strength of Indonesia with the strength that we have. The Indonesian army is trained 24 hours a day, 7 days a week. And their knowledge of military warfare is so far advanced from any knowledge of armed struggle that we have. I can only be brave enough to take up arms when we have the same military strength to face them. But I don’t feel brave to take up arms before then. I choose to struggle nonviolently. I have experienced these terrible things that have made me strong. But not just I, everyone in Papua have memories of suffering. These experiences are a source of courage for us. I feel certain that we have to struggle nonviolently. I feel strong when we resist with nonviolent strategies and tactics and our movement isn’t labeled with negative stigmas. People on the outside can see that we’re struggling nonviolently. I don’t feel scared to struggle nonviolently. One of the sources of strength of nonviolent resistance is that it is not only me who is struggling, it’s all of us Papuans working together. We also have amazing leaders, particularly religious leaders who have made us realize that also West Papua is going to be a better place if people struggle nonviolently. More people will be involved. We’re not just talking about forming a new nation we’re also talking about how we can live in the midst of that struggle and you know civil resistance is a better way, it allows us to live better in the midst of struggling for something better. Maybe because I’ve got an understanding and knowledge of civil resistance that I feel brave. If we could get lots of arms, I think Papuans would struggle violently. But we really don’t have lots of arms. We have some. But it’s nothing compared to what the Indonesia military has. I know that civil resistance can bring about change but sometimes I have doubts. Maybe we can’t do it through civil resistance because the Indonesian government is a type of tiger. It is a really bad type of tiger that we’re up against. And you know their thinking is, they should just kill us. What are you struggling for? What do you want? Speaking personally, we’ve got to get freedom quickly and that has to be through political means. But if I speak from the position of a WALHI Director, we need the support of various groups around the world who love the environment. Papua has the third largest forest. We love the forest and if this forest is destroyed that will have a global impact. People need to realize that what is happening in Papua is not just happening to Papua itself, it is something that is happening to all of us. We need people to work with us. We need institutional support. And we want people to campaign about Papua. We want people to campaign to stop the violence and if we work together we will be successful. We really need technical assistance with media. We also need to influence other countries, particularly the U.S. America has a big influence so the US should have a really clear and strong policy about Papua. That would be a really good thing. Obviously we want that policy to be in support of freedom. And of course if you look at the history of Papua the US has been really involved. I want to ask all Americans, all U.S citizens, to pressure their government to take responsibility for the fact that Papua is not free. I want you to know that I want to be free. I want freedom. That’s it. I want to be free. The BIG thing that I want, is for all the Papuan people to be involved in the civil resistance struggle. We have to work together. People can help by doing little things, making shirts and stickers and little things like that. We can start from little things like that. Tell your friends in Australia and the U.S., “Stop sending military weapons to Indonesia. Stop.” Because whenever we do things we face the military with those arms and those arms are sent by your countries and the military and D88 are being trained by your countries to kill us. We want to be free. We want you to help us be free. Indonesia doesn’t care about us as people. So the only thing that we want is to be free. We want to be free to live our own life in our own land. What is the role of women in the movement? Women have a really big role in the movement. Sometimes women feel like they are the enemy, that the military and the state see women as the enemy. We have a double challenge that we’re facing. We struggle against Indonesia but we also struggle against patriarchy in the movement. Se we have two enemies: the way women are treated within the movement and the evil and injustice of the state. We are definitely fighting against some of the men within the movement who think we aren’t capable. We need to struggle so that women are the same within the struggle. I never feel that women are better than men in the struggle. I’m just as great as they are, just as great as the men are. We need to get rid of this view that men are somehow better in the struggle. We need to erase that view. If men and women can have this same view then we will just have one enemy, not two. In terms of being elected as the director of WALHI, there were actually 2 people going for that position, a man and a woman, but I got the position. I feel proud about that. We are also supported by men’s organizations as well. So you know, this is a sign of our strength. I agree with what Fanny said, we are not just struggling for freedom we’re also struggling for equality within the movement. We can’t retreat from these two things. And of course, the evidence is before you now. These four women here are all providing leadership. The same is true in AMP and KNPB. Women are in leadership positions and telling men what to do, so yeah, we’re already there, we’re already playing positions of leadership in the movement. All this is just a fraction of what was happening. We could write down our whole history and send it to you but it would be a book! We carry all of the stories of what happened to us and what came before us in us. If we don’t do something, the next generation after us will experience even worse things. Fanny: But for me, of all of these terrible things that I’ve experienced, the worst thing was the killing of Mako. Mako was a really good friend of mine. And because of Mako’s death we have to struggle. Mako Tabuni really supported me to take a leadership position in WALHI. I became the director on the 13th and Mako was shot down on the 14th. At 5 o’clock I was elected to the position of director, and then at 7 o’clock Mako shook her hand and said, well done, fantastic. And then 8 o’clock the next morning he was shot down. There are many other things too, Kelly Kwalik’s killing, the killing of Arnold Ap, Theys Eluay’s killing, all those in the forest who have been killed. Heni: But Indonesia can’t do anything without the assistance of countries like Australia and the US. So we need to put pressure on them. Stop sending arms to Indonesia. Interview by Alex Rayfield and Claudia King. Photos taken by Javiera. The ongoing conflict in Papua is deliberately generated and professionally driven by Indonesian government through its defence system, purposely to defend the sovereignty of Indonesia over Papua. Beside political conflicts, economic factors play a certain role in initiating conflicts in Papua. As a result, both Papuan and non-Papuan civilians suffer the consequences, but mostly indigenous Papuans suffer the worst outcome of these conflicts. One of the regions in Papua that draws major attention of the Indonesian military is Paniai. The conflicts there that are deliberately initiated by the Defence force of the Republic of Indonesia in confronting the OPM troops led by John Yogi has left the people of Paniai in great devastation. These ongoing conflicts have left the civilians in a frightening and intimidating situation because Indonesian Police and Indonesian National Army have been doing mass military mobilisation and convoys, committing sexual harassment and assaults on woman and girls, carrying out unlawful arrests, torturing innocent civilians, and raids from house to house, confiscating hunting tools like bows and arrows, axes, and knives. The local people had to move to the neighboring villages searching for refuge, food and health. Some of them got sick and died, some were shot dead by the Indonesian military. Violence, intimidation and unlawful detentions by Police Army are escalating in Paniai in the last few weeks, especially to combat the (local) OPM movement led by John Yogi. Marko Okto Pekei, SS (Activist from Timika Catholic Parish) reported that the tense situation in Paniai has been going for a long period of time following the forceful disbanding (by Indonesian security forces) of the OPM HQ in Eduda in October 2012. After the incident, Indonesian Security Forces deployed massive number of Indonesian Military personnel in Paniai. On the afternoon of February 24th 2013 the people of Paniai witnessed the deployment of Indonesia Military into Paniai, 53 trucks dropped them. During the deployment, a source that did not wish to be named mentioned that an Indonesia police officer (told him) that, in February 2013 alone, the government ( especially the Defence Ministry) of Indonesia has deployed more than one thousand military personnel from Kelapa Dua Jakarta to Paniai. As a result, people in Paniai, especially fathers and young men, feel intimidated everywhere they go. They could not go out for gardening because of the fear that they would be suspected as members of OPM. During that tensed situation, Marko Pekei also reported that there has been raids carried out in the middle of the night in the villages, unlawful arrest, torture, and forceful kidnapping, abduction and killing of innocent civilians in Paniai. The latest cases for example are, Stefanus Yeimo who was shot dead by Indonesian Police (Brigade Mobile) at 15:30 (west Papuan time) in Kopo Paniai. He was shot when he and his friend were at a local store buying cigarette. According to the Indonesian Police (POLRI) the reason behind the shooting is, he was suspected to be member of OPM. At 18:00 on the same day, Stefanus was buried by his family in Kopo village, Paniai. Meanwhile, according to report from an Activist from Justice and Peace Division of Timika Catholic Parish, there is another victim from the Moni Clan; Indonesian National Army Special Team 753 in Uwibutu tortured him on Saturday March 23rd 2013 at 21:30 local time. After the victim was arrested he was beaten, kicked and was dragged along the asphalt road. At that time few by passers witnessed that violent and unjust treatment. The victim was even dragged into the police checkroom and brutally tortured until the next day and he was rushed to the hospital for medication. According to the relative of the victim who did not wish to be named, the victim was intoxicated but was not violent when he went to visit a family friend at the hospital. He left the hospital at 21:30 local time. That was when the Indonesian Army Special team 753 from Paniai unlawfully arrested him took him to their base and beat him up, tortured him and they took him the hospital. 1). Indonesian Army (TNI) and Indonesian Police (POLRI) to stop excessive terror, torture, kidnapping and unlawful arrests and shootings in Paniai. 2). Cenderawasih Regional Military Commander XVII and Provincial Police Commander to stop deploying military personnel in Paniai and as soon as possible withdraw the additional personnel that was deployed from Jakarta. 3). The military personnel who violates human rights in Paniai be brought to justice. 4) Cenderawasih Regional Military Commander XVII and Provincial Police Commander as soon as possible sack the Indonesian Army (TNI) and Indonesian Police (POLRI) personnel who are responsible for the ongoing violence in Paniai. 5). People, Government and Church to work together hand in hand, establishing communications from heart to heart in order to curtail the violence and human right abuses that has been going on in Paniai for a very long time. 7) Violence will never solve the conflicts in Papua, therefore We the PEPERA (Act Of Free Choice) Front would like to take this opportunity to demand the United Nation or a neutral third-party to immediately act unconditionally and according to the international law to end the political and social injustice in Papua. This statement serves as guide and to be carried out by the concerning parties who thinks Papuans deserves justice, peace and security in Papua and especially in Paniai. Selpius Bobii, Abepura Prison: Wednesday, 27th March 2013. Selpius Bobii is the General Chairperson of Front Pepera (The United Front of the Struggle of the People of Papua) and is currently one of the “Jayapura Five”, Political Prisoners held in Abepura Prison, Jayapura, West Papua. The five (Bobii, Forkorus Yaboisembut, Edison Waromi, Dominikus Sorabut and Agus Kraar) were found guilty in an opaque and predetermined trial of Treason (Makar) charges, laid after the violent Indonesian security force crackdown on the Third Papuan People’s Congress in October 2011.